The Department of Conservation (DOC) plans to go ahead with track building shortcuts that experts and locals say will increase pressure on kauri trees already at risk of kauri dieback, a deadly root infection. DOC is rolling out work in the upper North Island for 750kms of kauri forest tracks. 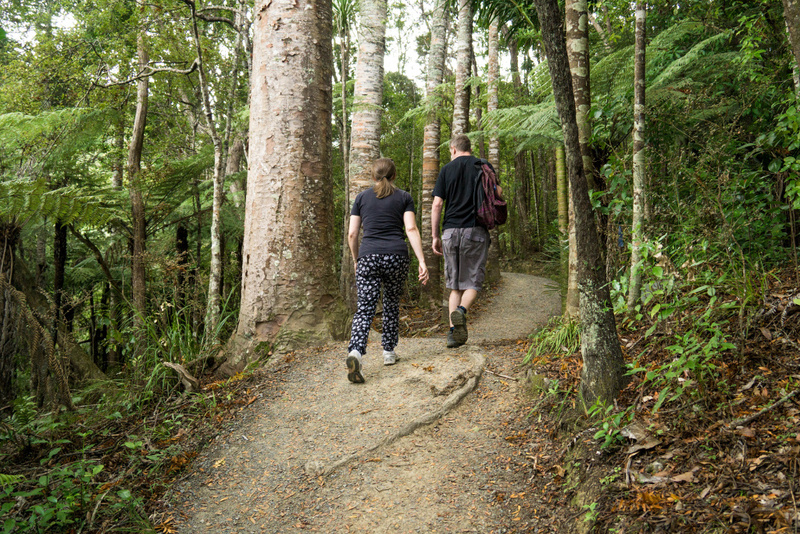 The proposal in the Okura Forest Scenic Reserve, just south of the Whangaparaoa Peninsula, adds well below minimal amounts of board walking and proposed alternative methods will worsen the plight of kauri rather than improve their future. Boardwalks and wooden ramps keep people’s feet off kauri and forest trees and have proven effective for 30 years. DOC openly states that these are considered to be the “gold standard” for the protection of kauri. However, DOC is planning to use a plastic web filled with bark and gravel in a marginally cheaper approach to protect kauri from kauri dieback. Friends of Okura Bush spokesperson Geoff Reid says, “We have witnessed destruction caused by contractors hired by DOC to build tracks in  the  past. Inadequate design, and lack of professional supervision resulted in many tree deaths for this rare coastal gem. This is  a department that is supposed to be looking after our natural heritage.” The design has to be in line with ‘best practice’ from the start. The public needs to have confidence in it. We represent the public and need to be consulted. Track construction for Okura Bush in 2011 has resulted in a massive spike in visitor numbers, DOCs records show from 9000 up to 70,000 walkers a year. It’s not the visitor numbers that kill the trees, it’s the substandard track design and construction that’s caused scores of ancient trees to die. Now there are big holes in the formerly pristine canopy of pre – European trees. Reid says he fears this will continue under ill-advised plans to upgrade tracks using unproven methods. Independent expert  Stephen King  advises that the gravel web system  DOC  intends for many North Island tracks are not the right solution to protect kauri. It’s actually a threat. Geoweb will worsen the situation for future generations as kauri roots grow into the gravel and once again become directly exposed to foot traffic where disease and stress place kauri at risk. For kauri this is a ticking time bomb. Boardwalks and ramps lift people’s feet above the root layer allowing sensitive kauri roots to thrive undisturbed. That’s why they’ve proven to work for 30 years. That’s why we need boardwalks and timber ramps to protect our significant trees such as kauri, kahikatea, matai, taraire and puriri. Despite the work and time local community members volunteer to protect and enhance Okura Bush, Reid says they have been left out of the decision making process and not consulted on the plans. We urgently need contracting processes to be immediately put on hold while DOC reviews its track upgrade plans and undertakes proper consultation with communities who care about their forests to avoid mistakes of the past and the waste of taxpayer funds. We acknowledge that DOC is committed to our forests and is underfunded but if they share their problems then much better solutions will emerge.